Just a few pics of a work in progress from a week or so ago.I may give away some of my secrets here, so don’t spread them around please! The brief was a red montero with a pointed front skirt and gold braid. The braid comes from Morocco and is just gold wire braided into a cord, more 1640s than all the russia braid that you see in the haberdashery stores which was an 18th century adornment. 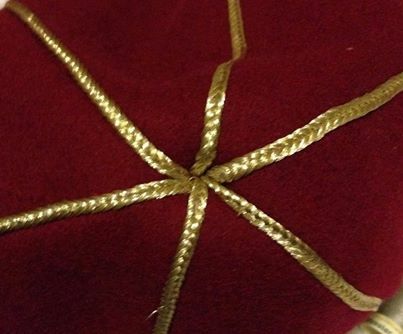 Here’s a photo of the newly finished and decorated crown. 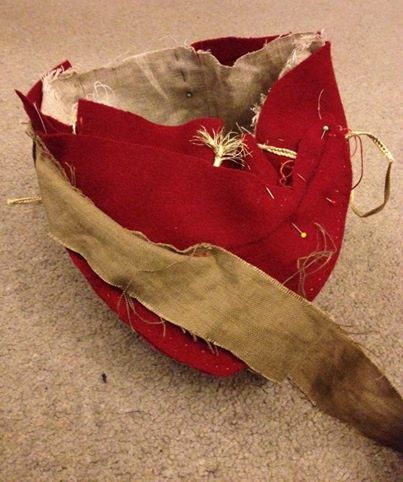 The next stage of making the hat is to sew together the crown, lining and peak together using the linen strip that will become the internal band of the hat. 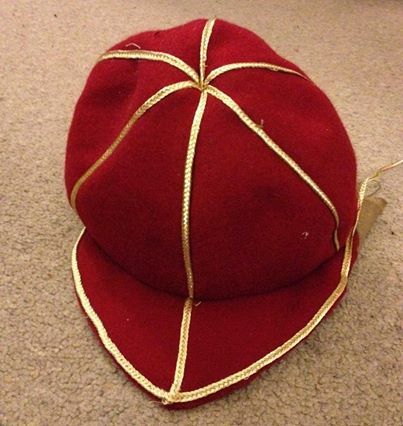 I have no idea whether 1640s caps had this internal band, but I’ve found it adds to the comfort of the hat and finishes the bottom edge off in a neat though still properly period manner. Here’s the seam half-way finished. It all looks a bit scruffy really, but all the internal workings disappear when the cap is finished. One this seam is done, all the excess fabric is cut away, leaving as small a seam allowance as I dare. The next photo shows the crown and peak finished, just waiting for the skirt to be fixed on. From this stage, all that needs doing is the skirt to be sewn to the outside of the crown, maintaining a half inch or so between the bottom edge of the crown and the skirt and then whipping down the internal band to hide all the scruffy inside seams. Voila!